First Book President and CEO Kyle Zimmer reads to children during a book distribution event. When it comes to learning to read, educators agree: the younger, the better. Children can be exposed to books even before they can talk, but for that a family has to have books, which isn't always the case. There are neighborhoods in this country with plenty of books; and then there are neighborhoods where books are harder to find. Almost 15 years ago, Susan Neuman, now a professor at New York University, focused on that discrepancy, in a study that looked at just how many books were available in Philadelphia's low-income neighborhoods. The results were startling. "We found a total of 33 books for children in a community of 10,000 children. ... Thirty-three books in all of the neighborhood," she says. 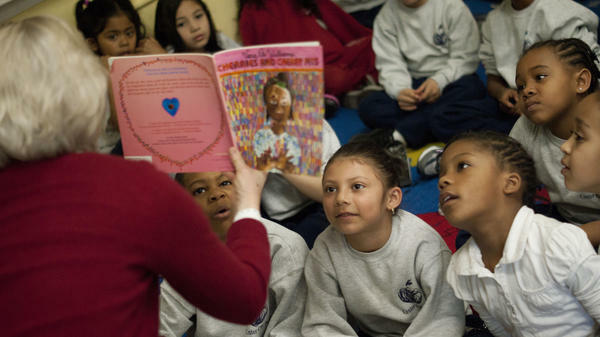 By comparison, there were 300 books per child in the city's affluent communities. Neuman recently updated her study. She hasn't yet released those findings but says not much has changed. And according to Neuman, despite advances in technology, access to print books is still important because reading out loud creates an emotional link between parent and child. "There's that immediate connection and that eye-to-eye joint attention," she says. "The parent is not looking at her cellphone or his cellphone; she is focusing on the child and the book. The second reason is the vocabulary that is contained in those books. Even very rudimentary, you know, beginning books, like board books, have vocabulary that tends to be outside the parent's normal, day-to-day interaction. So that child is learning words that he or she is likely not to see in any other place." Kyle Zimmer sits on a tiny chair surrounded by 4-year-olds at the National Children's Center in Washington, D.C. Zimmer is the president and CEO of First Book, an organization that has forged an innovative partnership with publishers to get books into the hands of kids who need them. Andrea Brunk, a physical therapist at the center, points to an array of picture books sitting on a couple of tables in the classroom. "First Book brought a huge variety of books for our kids," Brunk says. "They're all age-appropriate; they're diverse characters. And all the kids are going to come up after they're read to and they get to take two books home apiece." First Book began by setting up a book bank and distributing, at virtually no cost, unsold books that were returned to publishers and would otherwise be destroyed. It went on to create a children's book marketplace where it buys books from publishers in bulk at deeply reduced prices and sells them to a variety of nonprofit organizations. Zimmer says the books get sold to "virtually anybody serving children in need, from zero to 18 years of age. It can be a homeless shelter; it can be a formal classroom; it can be [an] abuse refuge; it can be really anyplace where kids are gathered." According to Zimmer, publishers like the program because it has opened a previously untapped market. Traditionally, children's book publishers catered to a very few. "On average, a premium picture book is about $18 at retail," she says. "And you imagine who the customer base is that can afford an $18 picture book for their family. What you're talking about is probably the upper 5 to maybe 10 percent of the socio-economic ladder." And First Book's nonprofit partners like the program because they can buy so many books so cheaply — at about $2.85 apiece. According to Brunk, in the past the National Children's Center was grateful for any books that came its way; now First Book lets the center choose exactly what it needs. She says, "We actually encourage people to actually just give us the donations, if they're OK with that, and let us do the picking because we can get them at such a reduced rate that their money goes further." Back in the classroom, the children are focused on their new books. Some sit quietly turning pages and looking at the pictures; some trade books with their friends; others gather around their teacher, listening to a story. Teacher Rose Campbell says that for the kids, the best thing about getting the books is that they can take them home. "At home parents can actually read to them and they can also read to their parents," she says. "So if we're reading a book here with them they can go home and say to the parents, 'Hey, we read this in class today.' So they're really excited about that." The National Children's Center has also set up a program for parents to encourage them to read to their children. Brunk says parents who attend a session will leave with a bundle of books. "The parents kind of know now: OK, this is theirs and they didn't have to do anything to get this — they didn't have to go the store and spend $16 to buy a book or something like that. But it's a high-quality book and the child gets to keep it. They don't have to worry about taking back to the library, that type of thing. And now they have the tools to work with their child. And I think that's really — we've really tried to empower them and say, 'Hey, you have everything you need and you can do this and you can make this difference with your child long term.' "
One parent who has taken advantage of both the books and the program the center offers is Alisa Jackson Gray. She had four children of her own and is now raising her grandson along with a great-niece and great-nephew. Gray says she has always read to her kids, but a lot of families in her community are dealing with so many problems that it's hard to make reading a priority. "Sometimes they don't even know where the next meal is going to come from," she says. But it helps to get free books from the center. "I was very happy and pleased to get my pack of books. And every night, my children and myself, we sit there and we read. ... I was very delighted to see my 1-year-old get the book and flip through the pages like she really can read. And she's pointing to the words and she's so impressed: 'Book?' [she says.] 'Yes, book!' "
Since 1992, First Book has gotten more than 100 million new books into the hands of kids from low-income homes. Zimmer says that providing books to those families and giving parents the support they need to read to their children can go a long way toward breaking the cycle of illiteracy. This is the first report in a three-part series on early literacy. When it comes to learning to read, educators agree the younger, the better. Children can be exposed to books even before they can talk. Of course that means a family has to have books. We are beginning a series of reports on programs that help kids get ready to read, and that includes kids from low-income families targeted by a program called First Book. NPR's Lynn Neary reports. LYNN NEARY, BYLINE: There are neighborhoods in this country where everyone has lots of books, and then there are neighborhoods where books are harder to find. Dr. Susan Neuman put a focus on that discrepancy in a study she did almost 15 years ago. Neuman, who is now a professor at New York University, set out to see just how many books were available in low-income neighborhoods of Philadelphia. The results were startling. SUSAN NEUMAN: We found a total of 33 books for children in a community of 10,000 children. NEARY: Thirty-three books per home you're saying. Is that right? NEUMAN: Thirty-three books in all of the neighborhood. NEARY: By comparison, there were 300 books per child in affluent communities in the same city. Neuman recently updated her study. She has not yet released the findings, but she says not much has changed. Despite advances in technology, Neuman says access to print books is important because reading out loud creates an emotional link between parent and child. NEUMAN: There's that immediate connection and that eye-to-eye joint attention. The parent is not looking at her cell phone or his cell phone. She is focusing on the child and the book. The second reason is the vocabulary that is contained in those books. Even very rudimentary, you know, beginning books, like board books, have vocabulary that tends to be outside the parents' normal day-to-day interaction. So that child is learning words that he or she is likely not to see in any other place. KYLE ZIMMER: Do you know this book? ZIMMER: OK, ready? It's called "The Snowy Day." NEARY: Kyle Zimmer sits on a tiny chair surrounded by 4-year-olds at the National Children's Center in Washington, D.C. Zimmer is the president and CEO of First Book, an organization that has forged an innovative partnership with publishers to get books into the hands of kids who need them. Andrea Brunk, a physical therapist at the center, points to an array of picture books sitting on a couple of tables in the classroom. ANDREA BRUNK: First Book brought a huge variety of books for our kids. They're all age-appropriate. There are diverse characters, and all the kids are going to come up after they're read to. And they get to take two books home apiece. UNIDENTIFIED CHILD #1: I got this one. NEARY: When the reading ends, the kids crowd around the tables to pick out their favorites. UNIDENTIFIED CHILD #3: I got Barney book. NEARY: You got a Barney book? UNIDENTIFIED CHILD #3: Yeah, and a princess book. Can you read it to me? NEARY: First Book began by setting up a book bank and distributing, at virtually no cost, unsold books that were returned to publishers and would otherwise be destroyed. It went on to create a children's book marketplace. It buys books from publishers in bulk at deeply reduced prices and sells them to a variety of nonprofit organizations. ZIMMER: Virtually, anybody serving children in need from 0 to 18 years of age - it can be a homeless shelter. It can be a formal classroom. It can be an abuse refugee. It can be really any place where kids are gathered. NEARY: Zimmer says publishers like the program because it's opened up a previously untapped market. Traditionally, she says, children's book publishers cater to a very few. ZIMMER: On average, a premium picture book is about $18 at retail. And you imagine who the customer base is that can afford an $18 picture book for their family. What you're talking about is probably the upper 5 to maybe 10 percent of the socioeconomic ladder. NEARY: First Book's nonprofit partners like the program because they can buy so many books so cheaply. BRUNK: Two-eighty-five buys one book. NEARY: Andrea Brunk says in the past, the National Children's Center was grateful for any books that came its way. With First Book, the center can choose exactly what it needs. BRUNK: And so we actually encourage people to try to just give us the donations if they're OK with that and let us do the picking because we can get them at such a reduced rate that their money goes further. NEARY: Back in the classroom, the children are focused on their new books. Some sit quietly turning pages and looking at the pictures. Some trade books with their friends. Others gather around their teacher, listening to a story. ROSE CAMPBELL: Oh, sorry, George, said the man with the yellow hat, I forgot to to fix your chair. NEARY: Teacher Rose Campbell says for the kids, the best thing about getting the books is that they can take them home. CAMPBELL: At home, parents can actually read to them, and they can also read to their parents. So if they're - we're reading a book here with them, they can go home and say to the parents, hey, we read this in class today. So they're really excited about that. NEARY: The NCC has now set up a program for parents to encourage them to read to their children. Andrea Brunk says parents who attend a session will leave with a bundle of books. BRUNK: The parents kind of know now, OK, this is theirs, and they didn't have to do anything to get this. They didn't have to go to the store and spend $16 to buy a book or something like that. But it's a high-quality book, and the child gets to keep it. They don't have to worry about taking it back to the library - that type of thing. And now they have the tools to work with their child. And I think that's really - we've really tried to empower them and say, hey, you have everything you need, and you can do this, and you can make this difference with your child long-term. NEARY: One parent who's taken advantage of both the books and the program the center offers is Alisa Jackson Gray. She had four children of her own and is now raising her grandson along with a great-niece and nephew. Gray says she's always read to her kids, but she says a lot of families that live in her community are dealing with so many problems that it's hard to make reading a priority. ALISA JACKSON GRAY: Sometimes they don't even know where their next meal is going to come from, and then when you come to school and you get a pack of books - I was very happy and pleased to get my pack of books. And every night, my children and myself, we sit there, and we read it. And I'm a mother two times - reading the books. You know, I was very elated to see my 1-year-old get the book and flip through the pages like she really can read. And she's pointing to the words, and she's so impressed - book? Yes, book. NEARY: Since 1992, First Book has gotten more than 100 million new books into the hands of kids from low-income homes. Providing books to those families, says founder Kyle Zimmer, and giving parents the support they need to read to their children can go a long way toward breaking the cycle of illiteracy. Lynn Neary, NPR News, Washington. Transcript provided by NPR, Copyright NPR.